Through a combination of centuries-old traditions of watchmaking and boundless imagination talented watchmaker named Ivan Arpa, created exclusive works of art of watchmaking, which have no analogues in the world. Arp began his career in brand Sector, then – in the Baume & Mercier. 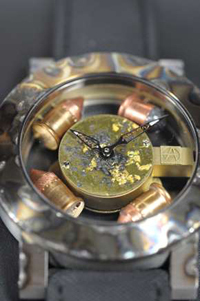 Watch company Artya as always excelled unmatched original performance. New Wristwatch Time Shot clearly hinted that the time kills – they set the 6 most of these cartridges!